According to the experts, what are the real dangers of eating fish during pregnancy? All fish are not created equal. This would be the first thing to remember when considering consuming any seafood. The guidelines for eating fish and seafood can be a little confusing. We’re going to break it down into a few simple rules to help make things easier for you. Fish can be an excellent source of iron, zinc and protein. These nutrients can be essential for your child’s growth and development. Eating fish during pregnancy can provide you with the all-important omega-3 fatty acids. Studies have shown that higher consumption of omega-3s has benefits including the reduction of allergies in infants. According to the Mayo Clinic, there are particular types of fish that can have a harmful impact. Deep-sea predatory fish such as king mackerel, swordfish, large tilefish or shark contain highly excessive levels of mercury. The mercury amounts are not high enough to be a problem for most adults. However, the mercury levels can be a problem if you are pregnant or planning to become so soon. Consuming large amounts of fish that are extremely high in mercury over an extended period can cause the substance to accumulate in your bloodstream. Excessive levels of mercury have been linked to nervous system and brain disorders. Harmful bacteria and viruses could be an unseen danger in uncooked fish and seafood. It is critical to avoid all raw shellfish including sushi and oysters. Be sure to refrigerate any uncooked seafood immediately. The importance of avoiding fish known to be contaminated with pollutants cannot be understated. Check out the source and know where your fish is coming from. Researchers have not yet determined whether only using supplements can promote fetal brain development. Therefore, women who are expecting should strive to get fatty acids from many other sources. Many experts recommend eating various forms of seafood for this reason. 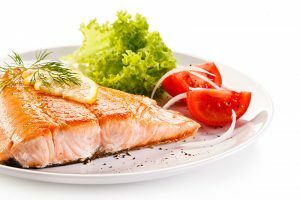 According to the Food and Drug Administration’s dietary guidelines, pregnant women can safely consume between 8 to 12 ounces of a variety of low-mercury seafood per week. We have compiled a list of various fish and types of seafood that can be safely added to your diet. Follow along with the safe seafood list below to consume your beneficial omega-3s with no worries. By using these guidelines, there is no reason why you cannot enjoy seafood. The list below can help you make seafood a regular part of your menu plan. Receiving and maintaining adequate amounts of healthy fat including omega-3 is essential during the pregnancy. Our bodies do not produce omega-3s on their own. Therefore, we must supplement to be sure to receive adequate amounts. The action of these healthy oils helps to regulate many essential functions including blood clotting, nerve transmission, inflammatory and allergic responses. The hormone-like substances found in the essential fats also help the gastrointestinal tract, kidney function and produce many other hormones. • Seeds and nuts: Canola oil, walnuts, sunflower seeds, soybeans and flaxseed. • Fish oil supplements: Currently, there is no set standard recommendation for how many omega-3s we require per day. Suggestions range from a dosage of 500 to 1,000 milligrams daily. • Fortified foods: Milk, eggs and yogurt.